You must be a member of the Brussels Drawing & Painting Group to attend this activity. Would you like to join this group? For the Chinese, 'to write' means 'to paint one's ideas'. 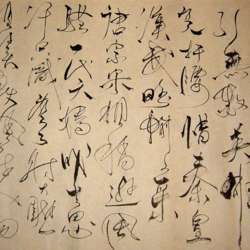 The characters flow together in a game of ink, they obtain their own rhythm and become abstract shapes..
Painting and calligraphy also require a certain technique to master the brush as each stroke is defined once it is set on paper. The talent of the artist at work becomes clear through his calligraphic expressions. Our teacher Zhang Wenhai studied Chinese painting at the Academy of Fine Arts in Shanghai and obtained a Master in 'Arts plastiques, visuels et de l’espace' at the Royal Academy of Fine Arts in Brussels. He masters the traditional Chinese painting and calligraphy techniques and teaches those already for many years in Brussels, to adults as well as to children. Join us for a 'hands on' workshop of Chinese calligraphy, a unique opportunity to learn first hand ànd to put into practice how to master the basic brush strokes, to make a composition and to set the characters on paper. The workshop will be taught in French by Mr Zhang Wenhai but translation into English and Dutch will be available as needed. All special calligraphy materials will be provided and drinks and snacks will be served throughout the workshop. You will receive further practical information as soon as you register. Thank you for your kind understanding and looking forward to welcome you for this amazing workshop !